View More In Hot Melt Adhesives. PRACTICALITY: Heating quickly, a fast plastic, suitable for a variety of workplaces, can also be used for glass, ceramics, wood, cloth, paper, plastic and other items, but also to fill gaps in windows and doors, patch floor tiles, DIY handmade jewelry And linked to the paste. 1、Do not open the switch when not in use for a long time to place. 2、A plastic mouth temperature higher work do not touch, please stay away from children. 3、Placed in a dry and ventilated place, pay attention to clean. 4、Do not use inferior glue stick, in order to avoid impurities blocking the outlet. 5、About 3-5 minutes ahead of time cut off the power, such as plastic run out, the temperature down, the plastic will not melt and flow out due to power. HIGH MATERIAL: Ethylene-vinyl acetate copolymer (EVA resin) as the main material, adding tackifier and other additives made of solid adhesive, non-toxic and tasteless, safe and secure. HIGH QUALITY: Fast bonding, high strength, anti-aging, good thermal stability, good film toughness and other characteristics of the safe leakage. Ergonomic design, in line with all types of manpower, grip comfort, suitable for long hours of work. 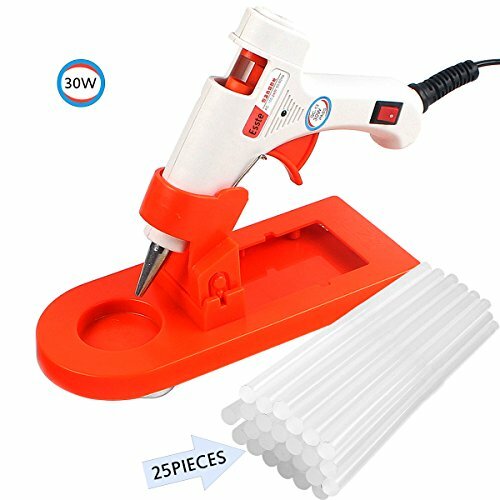 UNIQUE DESIGN: Equipped with a special base, and is designed to overflow plastic tank to prevent the glue state overflow, you can also add a little water for easy cleaning. Base design has four powerful sucker, can be firmly fixed on the desktop, to prevent glue gun dump inconvenience and scald. If you have any questions about this product by Esste, contact us by completing and submitting the form below. If you are looking for a specif part number, please include it with your message.